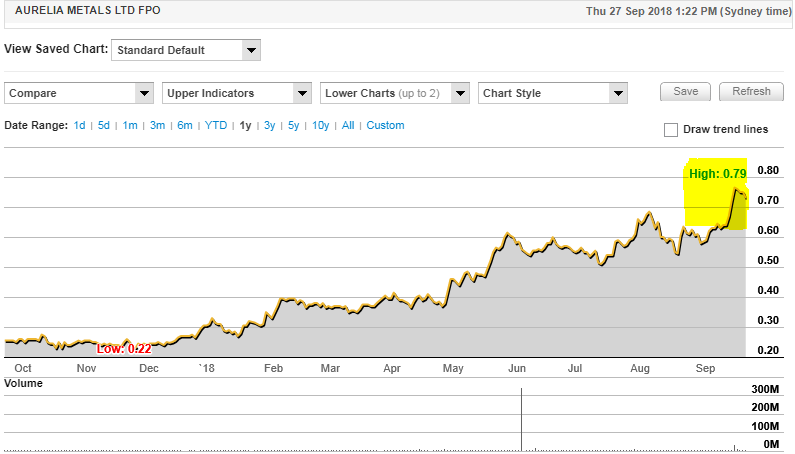 Aurelia Metals Ltd’s (ASX:AMI) share price certainly doesn’t resemble the type of ‘under the radar’ stories that we tend to focus on when identifying Speculator prospects. In the last six months its share price has roughly doubled from less than 40 cents to recently hit a 10 year high of 79 cents. It has been an exceptional year for Aurelia as the company transitioned from its established Hera project to a dual asset precious and base metals producer following the April acquisition of Peak Mines. The successful acquisition of Peak Mines on April 10, 2018 transformed Aurelia into a larger more diversified gold and base metal producer. The company now has a dominant position in the highly productive Cobar Mineral Field, with two processing facilities capable of producing gold, lead, zinc and copper. The total purchase payment to NewGold was $93.4 million, however the company acquired the business with a net cash and working capital position of $34.6 million, leading to an effective purchase price of $58.8 million. Highlighting management’s astute purchase of Peak Mines, net cash flow during the first quarter of ownership was approximately $50.5 million (after capital and tax payments). The acquisition was funded through $85 million of new equity and a $45 million debt facility. The strong operating performance in the second half of the financial year enabled the company to repay all existing Glencore debt and all debt drawn to fund the acquisition. As at June 30, 2018, Aurelia was debt free. While the following is an impressive set of numbers for fiscal 2018 in terms of revenues, earnings, cash position, production and costs, it is the company’s near to medium-term growth potential that could potentially trigger a substantial rerating. 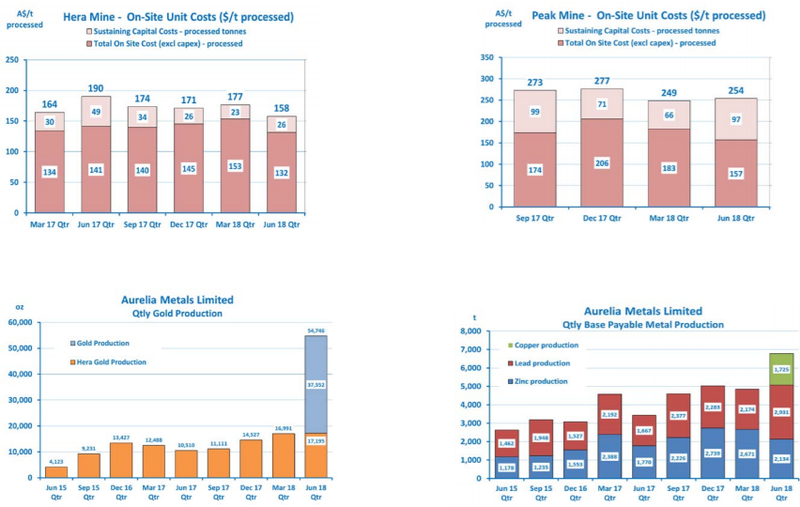 Aurelia has net cash of approximately $67 million, providing it with the capacity to fund internal projects under consideration such as a lead/zinc process expansion at Peak and copper circuit modifications at Hera, as well as mine development at Great Cobar and Nymagee. 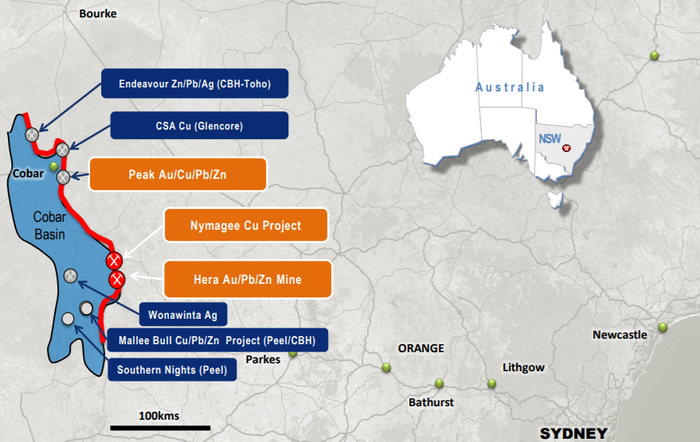 Both Hera and Peak are situated in the prolific precious and base metal producing Cobar Basin region of NSW. Glencore operates the CSA copper project just to the north of the Peak deposit, and it is worth noting that the global mining giant has a 5.4% stake in Aurelia. The CSA underground mine produces more than 1.1 million tonnes of copper ore and in excess of 185,000 tonnes of copper concentrate per annum. The concentrate contains approximately 29% copper metal and is exported to smelters in India, China and South East Asia. Glencore holds approximately 820 square kilometres of tenements in the local Cobar area. The company’s presence on the register is likely to increase in significance as a potential share price driver as Aurelia grows its resource at both projects and progresses towards being one of Australia’s most prominent mid-tier precious and base metals producers. Aurelia’s profile was lifted in September through its inclusion in the S&P/ASX 300 index effective from September 24, 2018. This no doubt contributed to the recent share price rally (shown in yellow) as savvy investors are aware that the company is now positioned for investment from large fund managers who previously wouldn’t have been able to consider the stock given they are in many cases index bound. Both Peak and the company’s flagship Hera project are low-cost multi-commodity producing assets that benefit from silver and base metal credits which drive down the costs of the core gold production operations. Management’s efficiency in quickly integrating the Peak Gold Mines project has impressed analysts, a factor that has not only cast the company in a good light in recent months, but it also augurs well for the future given that there is substantial scope for resource growth through exploration, as well as the potential for production increases which would be facilitated by expansion of its current plant facilities. It is developments such as these that have the potential to substantially increase production and earnings that don’t appear to be factored into the company’s share price. However, some analysts appear to ‘get the story’ more than others with Mike Millikan from Hartleys running the ruler across the company just this week. He noted that the company had one of the lowest all in sustaining costs (AISC) on the ASX with group AISC of $786 per ounce forecasts for fiscal 2019 likely to underpin a margin of approximately $900 per ounce on his assumptions of a $1685 per ounce Australian dollar gold price. The company’s impressive growth profile and management’s achievements in continually improving site productivity and efficiencies were factors that prompted Millikan to upgrade his price target from 85 cents per share to 92 cents per share. Low-cost production is expected to be sustained over a relatively long mine life given that there are substantial reserves of silver, lead and zinc in the orebodies that are in production. Furthermore, exploration success to date suggests there are extensions to the existing orebodies, as well as adjacent prospects which have the potential to contribute both precious and base metals. However, this is what the group’s inventory currently looks like. 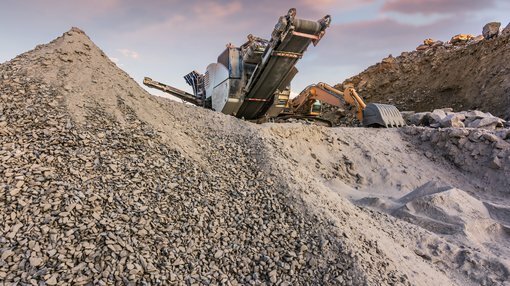 The following demonstrates management’s quarter by quarter success in achieving what all mining groups strive for — lower costs and higher production. Aurelia is progressing towards a number of important milestones in the coming 12 months, some of which could provide substantial share price momentum. However, before mapping those out it is worth looking at the basic expectations for fiscal 2019 referencing a combination of management’s projections and analysts’ forecast. Management has flagged gold production of about 50,000 ounces from Hera and 65,000 ounces from Peak in fiscal 2019, which based on credits from other minerals processed should equate to gold equivalent production in a range between 185,000 ounces and 210,000 ounces. Millikan sees this as conservative with his projections pointing to gold equivalent production of 245,000 ounces, generating a net profit of $116 million, representing earnings per share of 13.3 cents. 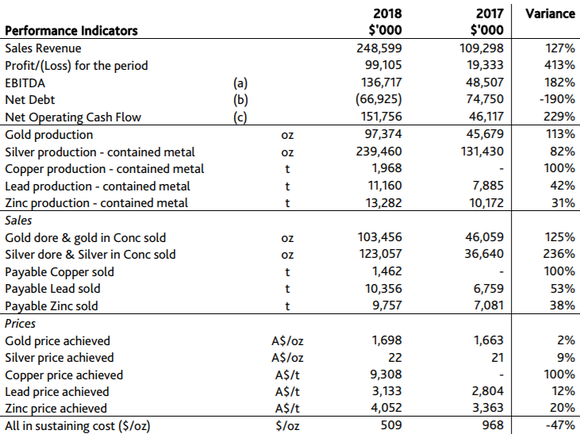 In gold equivalent terms his projections imply upside to management’s forecasts of about 25% at Hera and 10% at Peak. While price-earnings (PE) multiples are often fairly irrelevant in terms of valuing mining companies given earnings per share dilution from capital raisings, cyclical swings in commodities and foreign exchange rates and cost variances, it could be argued that Aurelia is a company that could lend itself to PE valuation metrics. Firstly, it is cashed up to the tune of nearly $70 million, making it unlikely that the company will go to market to raise capital through the issue of shares. Any big-ticket project items in the near term look to be covered, particularly given its net cash position is forecast to swell to nearly $140 million in fiscal 2019. Exploration costs for the next 12 months are fully covered and the possible plant constructions that are being considered are modestly priced. The company isn’t as exposed to commodity price swings as many of its peers because of its low production costs. Furthermore, management has a demonstrated record of operating efficiently and meeting targets. Consequently, the conservative PE multiple of approximately 5.5 relative to fiscal 2019 projections appears to bear some relevance. When talking mining companies and milestones, the attention is often on exploration upside, but in the case of Aurelia meeting its production targets and proving that it can continue to deliver low AISC’s could well have a share price impact. Other likely catalysts include the release of a prefeasibility study at Nymagee and results from an aggressive exploration campaign which is targeting numerous extensions to existing deposits and highly prospective new areas which are largely underexplored.